We offer several options for financing that save you money and suit the needs of your household. Armorvue Window and Door is committed to providing top-quality products at cost-effective prices. Because we deal directly with the factory, we’re able to pass substantial savings onto our customers, but that’s not the only way that we help you save money on your home improvement project! We offer flexible financing solutions for any budget to make it easier to afford new windows and doors since we have options to suit any budget with simple repayment terms that can be customized to fit your needs. To ensure we have as many options for our customers as possible, Armorvue Window & Door offers flexible financing for any budget from several leading financial institutions, such as GreenSky, Wells Fargo, and Service Finance. Our team is happy to walk our customers through the process of selecting the best financing for their unique needs, and we’re standing by to answer any questions you have about the solutions that we offer! 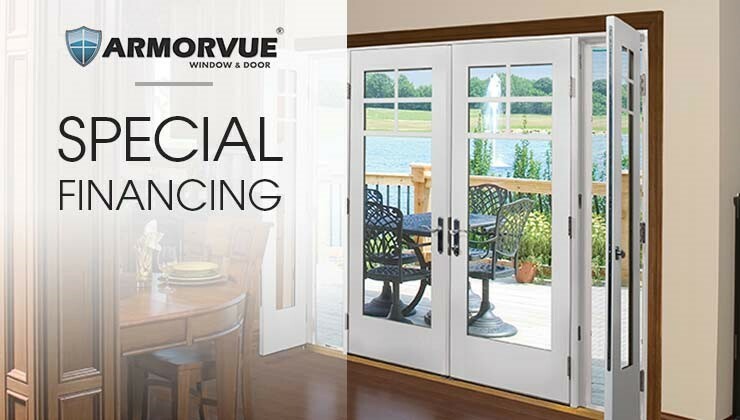 Contact Armorvue Window and Door today to learn more or to schedule a free, no-obligation estimate. Give us a call and see how our simple financing options can help you get the updates you need, or fill out our online contact form to get started!